Rarely do you come across a book that changes you forever. This is one of those very special, consciousness-raising texts. 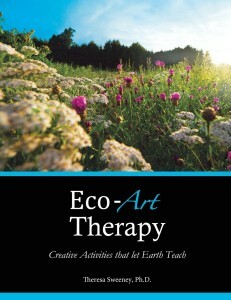 Far more than a self-help book, Eco-Art Therapy – Creative Activities that let Earth Teach is a self-help lifestyle. Chock full of stimulating quotes, inspiring pictures and restorative exercises, this manual provides unparalleled personal transformation. Note: This workbook is also the text for accredited online Eco-Art therapy classes and professional certification. All readers, therapists, educators and coaches are highly encouraged to expand their personal and professional skills with this truly life-changing tool. Visit http://www.ecoart-therapy.org for more information.